As Jessie J showed yesterday for Comic Relief, having your head shaved can be a liberating experience, and a beautiful one. When I was writing The Look, I knew the head shaving scene in the middle would be the scene that everything depended on. It was important to get it right. I worried about writing it, but in the end it flowed. And instead of being sad and nostalgic, as I’d expected, it turned out to be uplifting and empowering. Our heads are beautiful things. Losing your hair is not the end of everything. Thanks, Jessie, for raising money for some great causes. And showing us that a bare head can be a cause for happiness. This is a picture of my mood board as it currently stands. It includes press articles that have inspired me (about tutors of the super-rich), a picture of Diane Athill (inspiration for the next book), pictures of potential characters cut out of magazines, and pictures that were done by Year 7s at a school I visited a couple of years ago, and which are keeping me in the zone for my current main characters. It seems to be that time. I’m 10,000 words into the new book, and took time off during half term to go and visit Rye, where I’ve set the opening scene, and Winchelsea, just down the coast, which has some fabulous crusader tombs that I was interested in (very Da Vinci Code), and also, as it happens, Spike Milligan’s grave in the churchyard, but he won’t be making it into the book. I don’t think. So I’m researching, and it’s fun. Meanwhile, I’ve just written a piece about it for the Writers’ Forum. I think it might be out in April, but it was basically about my research for The Look. I’ve been asked about it by some students on a writing course. And I’ve been corresponding with a reader/blogger who’s writing her own novel this year (which sounds great), and wanted some tips. Here’s what I wrote for Beverley. Every writer’s process is different, as are ever editor’s and genre’s requirements. But if you’re looking for some ideas, this might be a start. I really enjoy the research process. It’s one of the joys of writing, but it’s important not to let it overwhelm the story. There can be a real danger that the book becomes a series of research notes, joined together, when it should be all about character and motivation. For this reason, nowadays I tend to do detailed research only once the story is well underway and the characters are developed. That way, the story stays in charge. It can of course mean making major changes to the text later – when you discover you’ve got something wrong (as I did in Rye just now – easily fixed), or you find out something so fascinating it takes the story in a new direction. But good writing is rewriting, so I don’t mind making changes if I have to. Now for outlining. Everyone is different, so do what works for you. I have some successful writer friends who get an idea and just get going with it. I must say, they’re in the minority. However, some really successful writers say that you should let your characters lead you. Personally, I’m more at the other end of the scale. I love it when my characters do unexpected things within a scene, but I want to know where I’m heading with the story. I’ve written too many 5000 word beginnings that end up running out of steam. I want a plot that I know makes sense, and characters with interesting arcs. I want an idea of the pace of the book, so I write an outline that’s generally about 40 paragraphs long (one para for every 1-2 chapters). I don’t follow it to the letter, and I change it – sometimes quite radically – as I go along. But it’s there to guide me. I also get a piece of blank A4 paper and draw my plot like a chart, with boxes for main events, and arrows to other boxes. I don’t necessarily use it so much later, but it really helps me think! My editor now gives us all a blank spreadsheet to fill in, going down scene by scene and saying for each one location, characters, motivation, main theme, minor themes etc. It looks very hairy! I did it a couple of times and didn’t use the results, but found it very handy to help with my thinking process. It showed up a couple of places in the plot where it wasn’t really going to work. I have my mood board, where I stick up pieces from newspapers and magazines that have helped inspired the story, to remind me, and pictures of people who look like the characters. 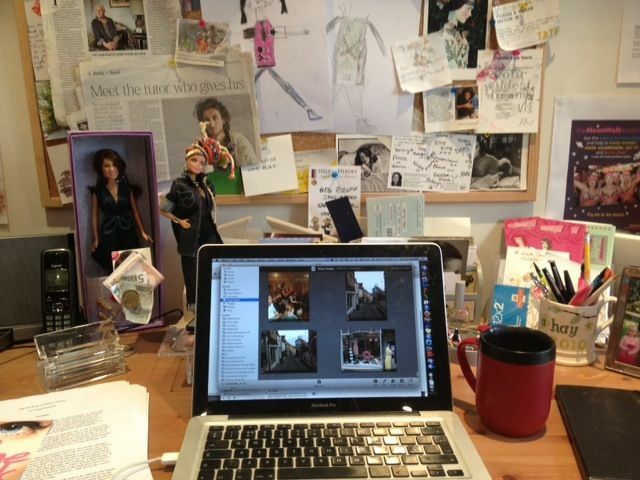 When my publisher comes to do the cover, she usually asks to see the mood board these days. Last year was terrible for most of my writer friends and me. Hard to say exactly why – it just was. We struggled, and were disheartened, and were late, and often seriously wondered if we’d finish at all – but we all did, eventually. What some of us learned was that for the first draft, you just have to keep going and get it out there. Don’t expect it to be perfect. It’s not what the finished book is going to be like. It’s your first go at the story, and it may change because you’ll learn as you go along, but it’s important to finish it. After that, things get easier. A little tip I was given at a low moment was to try and write 1000 words a day (which is much less than I usually try and write). 1000 words isn’t so much. You can do it in an hour or two. But over 70 or 80 days … you’ve got a book! So if it’s getting tricky, just stick to 1000 words a day and keep it moving. The amazingness will come in the rewrite later. Good luck, Beverley! I hope this helps, and I’ll be rooting for you. Today, The Look is on day 4 of its US blog tour, and I’m talking to the lovely Molli at Once Upon a Prologue. This time, it’s all about my favourite London places, which include the shoe shop that sells ACTUAL DOLLS INSIDE SHOES (check out the blog – there’s a picture) and the best ice cream parlour in London. Believe me. I know of what I speak. Meanwhile, my copies of the US edition, as you know if you’ve been reading this blog recently, arrived in a nice cardboard box from America not too long ago, and today I performed one of my favourite rituals: adding the latest edition to my bookshelf. It now looks like this, and the shelf is nearly full. I had to remove 2 Harry Potters to make space for this one. WOO! This is not my doing, I must add. I’ve still only written the 5 books, and one of those isn’t out yet. 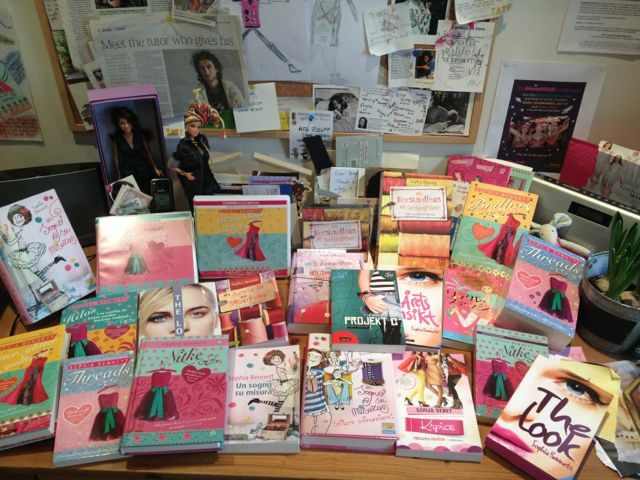 This is all the work of the truly wonderful Elinor Bagenal at Chicken House, who persuades lots of people in other countries to buy the books, and Rachel Hickman, who persuades people like Tammy and Mizz magazine to make special editions in the UK. They all add up and make me look much more prolific than I actually am. This can only be a good thing. I’m so grateful that so many people have put so much effort into making my stories available to girls (and boys, and some grown-ups) around the world. When your main job is to sit in the shed and make stuff up, what happens next is a pretty amazing thing. Already it’s Day 3 of the US blog tour for The Look. I’m so enjoying this – making new blogging friends and seeing what they think of Ted and Ava. 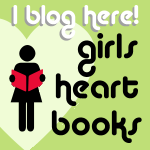 Today I’m on Rather Be Reading, talking about literary sisters. They also have a review of The Look. Thanks, Estelle! Yesterday, I did an interview for the lovely Aneeqah on My Not So Real Life. Day 1 was an exclusive extract on Supernatural Snark. It was great to share Tina di Gaggia with new readers in America. Must do that again sometime!